The Egyptian embassy in Switzerland has received the 7 sacred oils tablet and it should be sent back to Egypt in the next few days. The tablet represents an offerings tablet for the seven sacred oils. It dates from the beginning of the 6th Dynasty. The seven sacred oils are those used in the Opening of the Mouth Ritual for the anointing of the mouth and eyes of the statue or mummy of the deceased. 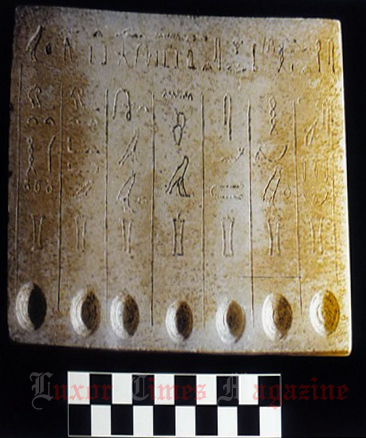 The travertine (Egyptian alabaster) tablet measures 16.5 x 7.7 x 1.5 cm. It includes 7 depressions to contain the oils. It was found by the Egyptian-Australian mission worked in the area of the king Teti cemetery, at Saqqara in 1996.